I think every mom would agree that the momiform is one of the best inventions (if you can call it that) ever because every mom needs something easy, quick, and comfy to jump into and last through a day of errands, chasing after children, driving the carpool, etc. 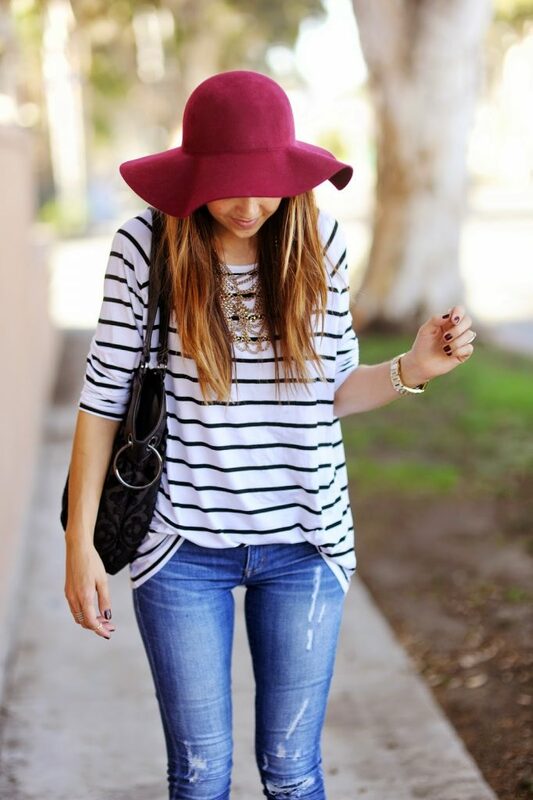 For me, a striped tee and jeans is my go-to momiform outfit, but the basics often beg to be spiced up a bit (and changing up accessories makes it less noticeable when you wear it three days in a row…not that ever do that…). 1. Hats. I’m super in to hats this year, and think they’re such a great and unexpected addition to a basic mom uniform. Floppy hats, fedoras, beanies, and baseball caps are all acceptable (even encouraged), and will go with everything. Find some of my favorites right here. 2. Jewelry. I feel like nothing makes me look more put together than jewelry. Lately I’m super in to delicate jewelry, but wearing your basics is a good time to pull out the statement jewelry, like with this gorgeous bib necklace I’m wearing here (although it’s hard to tell with my hair). See some of my favorites in this post here. 3. And lastly, shoes! When your outfit is so basic, let your shoes do a little more talking. Go for a bright color, a bold pattern, or something unexpected like these gorgeous hand-beaded buyamba flats that make a little statement. What do you mama’s do to make your momiform a little more fun? p.s. 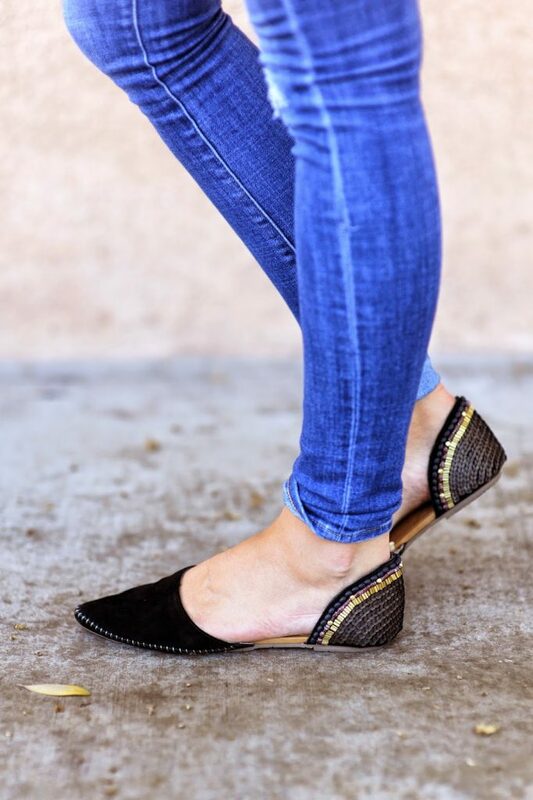 Buyamba (who makes my gorgeous beaded flats) is an amazing company that is helping women in Uganda earn a living by hand-making the beads and adding them to the shoes. They have an amazing mission, an even better story, and are doing such a great thing by helping these women in need. You can learn more about their mission and company here and here! Anthropologie is also now selling some of their fall collection, which you can check out right here, or find their full fall collection (including these flats) right here. Loving those flats, though! I enjoy seeing ethically-conscious clothing styled in wearable ways.. They also subtly match your hat, haha. How does the neck of that shirt fit? It looks like the perfect shirt but I hate when the neck is so big and I always have to worry about adjusting. Love this outfit by the way! It’s actually not loose or wide at all. I never have to adjust it during the day! It doesn’t look like it in your pictures, just on their website. Awesome, thanks! I’m getting it! Bought this shirt after it looked so cute on you. It is huge! (And I’m bigger than you). How did you get this shirt looking so good? Did you modify it, please tell!! oh no! No, I didn’t modify mine at all…I just tuck it in at the front and bunch up the sleeves and it makes it look less oversized. Try that maybe? I’m so sorry! Fantastic necklace and shoes, they totally give this outfit a whole new dimension! You look gorgeous! I love the floppy hat! I agree these accessories really add to an outfit. Those flats are so awesome and it’s always great to support a company that helps others. I love your jeans a lot! 🙂 Where are they from? They’re from dittos — the link is in the post above! What’s your experience with shopping Sheinside? I love your outfit ideas! Really beautiful and versatile, smart, practical.